This is a Finnish Käpy, pronounced gapuu. The original ones were made of wood. 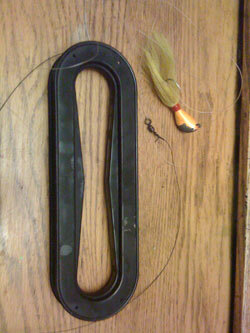 One of my most favorite ways to fish is with a hand line, wound around a large spool. The Finnish word for the spool is këpy and is pronounced gebuu (sort of). We use them for ice fishing for lakers and for bobbing at Isle Royale for the same. The spool is designed so one full wrap is about 2 feet of line, so you can count the wraps to know how deep you are fishing. This used to be the only way to figure out the depth, before electronic depth finders. Back in the late 80’s and early 90’s we would go out to an area that we felt was close to 180 feet and one of us would drop a line, counting the wraps, and either find that it was too shallow, too deep or just right. If it was right the rest of us would also drop our lines and start to fish, or if not right, wind up the one line, move to a different spot and try again, until we found a good depth. The line has to be about 45# test, non-stretch. We used a plastic coated steel braided line with a swivel and about 6 feet of 25# test monofilament, then the leaded jig with smelt tail or a piece of sucker. The method was to fish the bottom by slowly jigging up and down by holding the këpy in your hand. Sometimes in order to feel a bite, if they are small fish or not biting very aggressively, we would hold the line in our bare hand. When you feel a bump on the line, or anything different than the normal weight of the jig and line, a quick tug is needed to set the hook. You then have to pull the line in, hand over hand, about 2’ at a time, carefully piling the line at your feet until the fish is in. For the smaller fish, under about 5 lbs, no net is needed, but for the larger ones we would have our partner net it. When the fish is in, a quick re-baiting is usually needed, then toss the jig overboard again being careful not to let it tangle. Beginners will most often get so excited hauling in the fish that they don’t pay attention to where the line is going. Then, when letting it out again there is a massive tangle. The fisherman’s true nature seems to come out at this point. If a patient type, he will spend an hour or so playing with the tangle. If he is the impatient type, or if the fishing is good, he will just pitch it in a bucket for later entertainment. The Very impatient, expressive type will say a few choice words appropriate (or not) for the occasion. It is important to keep your jig very near the bottom, because that’s where the lakers are and the visibility is not very far at depths of 150 feet or more. You can see on the picture of the jig, how the paint is all chipped off from bouncing it off the bottom. Actually, tapping it on the bottom may attract fish sometimes and entices more bites. 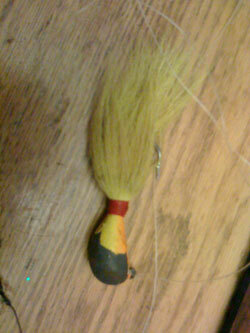 Lead bobbing jig. Notice the chipped paint from bouncing off the bottom. For beginners, a large (4 or 6 oz.) jig is best, as it’s hard to feel bottom with a lighter jig. With 200 feet of 45# test line out, you can lay the jig on the bottom and not know it… the jig has to be moving in order to get any bites. Favorite colors are white, orange and reds. Tinsel on the tail seems to help attract more fish also. Some of these jigs come with a treble hook on a trailer, about 1” below the single large hook attached by a heavy braided line. This method is not the best for catching the really big lakers as the leader tends to break when setting the hook. 20 lbs seems to be the limit for size that you can catch with this method. Over the past few years, many fishermen have been converting to short, stiff rods with level wind reels. It’s a little harder to feel the small hits with them, but the success rate for the larger fish is better. When the fishing is good, you can pull them in steady, sometimes not even able to get to the bottom each time. When it’s slow fishing, just enjoy the quiet and be ready for that occasional bite. Drift bobbing has become the favorite way of most guys I know. 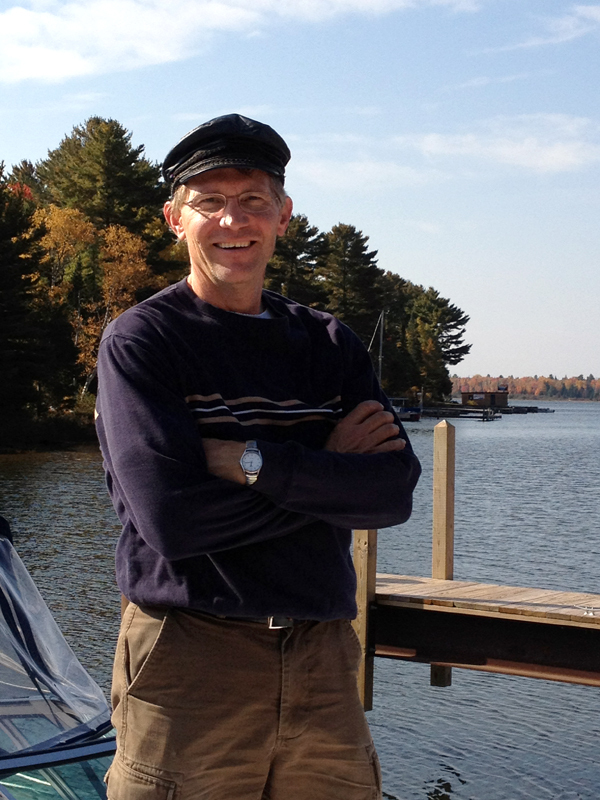 We will try to position our boat to drift across a known hot spot and fish as we cross it. Some of our drifts will be 5 minutes, sometimes an hour depending on the bottom contour. If we catch fish, then we will try again, it not, we’ll try another spot. Sometimes the wind will not allow drifting. Even with a drift sock out it’s just too fast to “hold bottom”. In this case we will try to anchor over the “hole”. This sometimes requires letting out 400 or 500 feet of line and an extra anchor. You can imagine with that much line out, there is a lot of swaying back and forth. This sway of the boat can cover a lot of water, and will sometimes produce fish on one area of the sway. It’s not always easy to determine where the boat will end up, but with a little luck, and maybe a little skill, we anchor over the fish and catch our limit. At any rate, it’s pure fun and relaxation!